Beatrix Potter was born in London in 1866 and grew up living the conventionally sheltered life of a Victorian girl in a well-to-do household. She was educated at home by a governess with her brother Bertram. Her constant companions were the pet animals she kept which she enjoyed studying and sketching. On summer holidays she delighted in exploring the countryside and learning about plants and animals from her own observations. 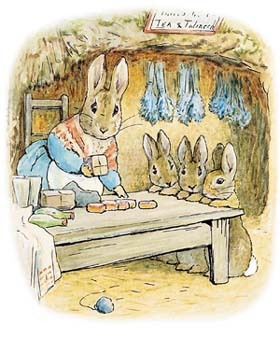 Beatrix Potter’s career as a children’s illustrator and storyteller began when The Tale of Peter Rabbit was published by Frederick Warne and Co. in 1902. The public loved it as soon as it appeared and Beatrix went on to produce on average two books a year until 1910. In the early years of publishing her editor was Norman Warne and they fell in love and became engaged in 1905. Unfortunately the marriage never took place as Norman died suddenly. The money she earned from her ‘little books', as she called them, gave her financial independence and she began to purchase property in her beloved Lake District. In 1913 she married William Heelis, a Lakeland solicitor, and made Sawrey her permanent home. The standard framing is double-mounted in a high-quality one-inch square plain oak, protected with clear wax. Shipping by courier of the framed prints to any UK address is only £9.50 for one or more items. 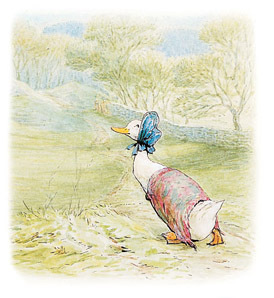 All the Beatrix Potter images are copyright FW & Co. 2007 & 2010. No reproduction without permission.